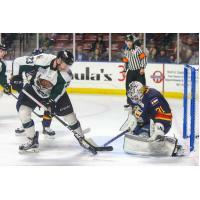 Kelly Cup Champion goaltender Joe Cannata has been assigned to the Utah Grizzlies from the Colorado Eagles of the AHL. Cannata won all 16 postseason games for the Eagles in their 2018 Kelly Cup Championship run. During the 2018 playoffs, Cannata had a 2.55 goals-against average and a .913 save percentage in 24 games. Cannata was 21-5-2 for Colorado during the 2017-18 regular season, and tied for the league lead with a .931 save percentage. "Joe is an elite goaltender and was a big reason why Colorado won last season," says Grizzlies head coach and general manager Tim Branham. Cannata has appeared in 121 AHL games in his career from 2012-18. Grizzlies notes: With the first win of the regular season, Tim Branham breaks the Utah Grizzlies record for wins by a head coach. Branham is tied with Butch Goring with 178 wins. The Grizzlies have reached the postseason in 10 of their last 11 seasons.